From 1986 to 2010, the proportion of graduates from postsecondary institutions who participated in a co-op program rose from 7% to 22% among college graduates, and from 5% to 12% among bachelor's graduates. A co-op program can be defined as a form of work-integrated learning that alternates periods of in-class learning with periods of paid work. Co-op programs have the potential to facilitate the labour market integration of new graduates by providing suitable work experience. These results come from the new study "Co-op participation of college and bachelor's graduates." 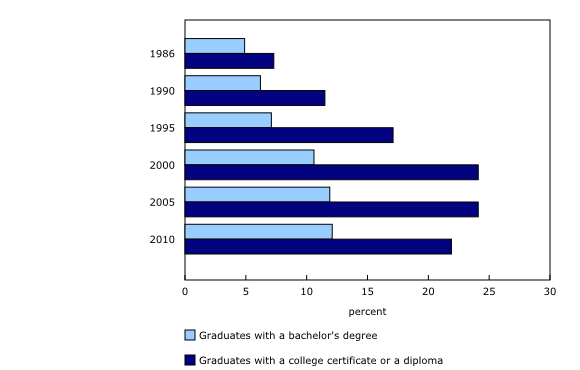 In the study, college graduates refer to those with a college certificate or diploma, while bachelor's graduates are those who completed a bachelor's degree. In 1986, Ontario (12%) and Newfoundland and Labrador (11%) had the highest college co-op participation rates among the provinces. From 1986 to 2010, college co-op participation rates increased in every province, but grew faster in some provinces than others. By 2010, Manitoba (32%), Ontario (31%) and Nova Scotia (27%) had the highest college co-op participation rates among the provinces. Newfoundland and Labrador followed with 22%, and the rates ranged from 10% to 16% in the other provinces. At the bachelor's level, Newfoundland and Labrador (19%) and British Columbia (18%) had the highest rates in 2010, followed by Nova Scotia (16%) and Ontario (13%). In the six remaining provinces, bachelor co-op participation rates ranged from 7% to 10%. It is possible to examine trends in co-op participation by field of study, but only among bachelor's graduates. In 1986, nearly one-third (31%) of co-op graduates with a bachelor's degree came from architecture and engineering programs, and another 25% came from physical science, mathematics and computer science programs. From 1986 to 2010, the number of co-op participants continued to increase in these two areas, but were eventually outnumbered by co-op participants from other disciplines. By 2010, 22% of co-op graduates came from architecture and engineering programs and 7% came from physical science, mathematics and computer science programs. Another 25% came from commerce, management and public administration programs, 15% came from social sciences, psychology and law programs, and 31% came from all other programs. In 1986, women accounted for 55% of all graduates with a bachelor's degree, but accounted for 42% of those who had participated in a co-op program. This reflected the fact that there were fewer women in programs that had higher co-op participation rates, such as architecture and engineering. In subsequent years, the development of co-op programs in fields of study that have a higher proportion of females (such as commerce, management and public administration programs as well as social sciences, psychology and law) resulted in higher co-op participation rates among women. By 2010, women accounted for 60% of all graduates with a bachelor's degree, and 55% of all co-op graduates at the bachelor's level. This study examines changes in co-op participation rates between 1986 and 2010, using data from the National Graduates Survey (NGS). The NGS is a survey of graduates from Canadian public postsecondary education institutions who graduated or completed the requirements for degrees, diplomas or certificates in a given year. The population of interest for this study is graduates with a college certificate or diploma or a bachelor's degree. For the first time, the reference period for the 2009/2010 cohort of graduates was the school year rather than the calendar year as was the case for previous cohorts. In this study, 2010 refers to the 2009/2010 cohort. In all waves of the NGS, the survey was conducted two years after graduation, except for the 2009/2010 class of graduates for whom data were collected three years after graduation. This difference has no effect on this particular study, because the time at which the survey was conducted had no influence on the type of program (co-op versus non-co-op). The article, "Co-op participation of college and bachelor's graduates," is now available in Insights on Canadian Society (Catalogue number75-006-X).